Please explain the $14,000,000 budget deficit you left Mayor Lewis to deal with? Arizona's constitution prohibits deficit spending, so a budget deficit is not possible. Gilbert's Town budget is forecast on a rolling five year basis. Staff tracks actual revenues against projected revenues on an ongoing basis. Like any fiscally responsible entity there is usually a need to reforecast budgets at different points of time to match revenues. What Mayor Lewis inherited was a budget where the projected revenues were not going to match actual revenue. The money had not been spent, there was no debt. The Mayor and Council did have to adjust spending plans. This is quite different than the Federal Budget Deficit where a debt is created that has to be repaid. A budget reforecast is very different than a budget deficit. What Mayor Lewis did inherit was $12.5 million dollars on cash hand in the towns contingency fund: That fund no longer exists. Why didn't Gilbert have any Regional Representation under your administration? There are Three regional and one State organization for local elected officials. AMUA (The Arizona Municipal Water Users Association) is the organization that divides the Arizona's allocation of CAP water from the Colorado River. This is the cheapest and best quality water available to us. I served as Chairman of the Board of Directors of AMUA. Gilbert is currently represented by Councilmember Peterson on that board. MAG Transportation Policy Committee divides federal highway money, highway user fund money, and prop 400..1/2 cent sales tax money. I was elected chairman of that committee, I defeated Mayor Smith of Mesa for that position. MAG is the largest regional planning organization, tasked with transportation issues for our region. MAG is made up of 28 Mayors and representatives from the Board of Supervisors and State Legislature. My peers elected me to be one of six members of the executive board. Arizona League of Cities and Towns, is the statewide organization that represents the interest of the Cities and Towns, typically at the legislature. I was honored to be elected by my peers to the Executive Board of The Arizona League of Cities and Towns. Other than being chairman of Phoenix Gateway Airport, which is a rotating position, I held twice, I am not aware of any positions of leadership Mayor Lewis has been elected to by his peers. What is the real story behind the Zinke Land Purchase? Gilbert has a shortage of park space. If you are looking for a place to picnic there is not a problem. If you are trying to schedule Little League, Soccer Leagues, or Football Leagues, you know we need more parks. The council goal was to acquire some large tracts of land for parks while it was still available. We have an obligation to do things for the long term benefit of the town. 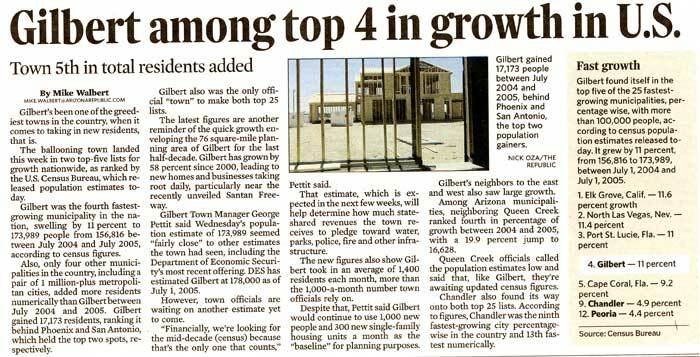 Why didn't Gilbert have a "Strategic Plan" for the last ten years? Gilbert has had an Economic Development Strategic for over twenty years. This plan was developed by the Towns Economic Development Department with input from Gilberts Economic Development Advisory Board. The strategic plan was updated at Town Council Retreats for the last fifteen years. If you would like a copy of Gilberts strategic for any of the last 15 years I recommend you file a public records request with the Town Clerks Office and you will be provided with one. What is your relationship regarding Green Global? There have been some questions regarding my relationship with a Green Global, a solar energy provider. I have never been an employee of Green Global. I was one of two employee's of a Think Green Renewable Energy. The other employee is Lanny Brown, the CEO. I severed that relationship October 4, 2011 when I tendered my resignation. I asked that I be removed from all corporate filings at that time, and assumed it would be done expeditiously. I was never paid one penny for my work at TGRE owned no stock, and had no voice in any TGRE decisions. I incorporated my own company North American Renewable Energy, September 21, 2011. North American Renewable Energy has represented Green Global in cities other than Gilbert, and represents a number of other firms in the renewable energy industry, including those manufacturing solar panels, biomass producers, and ethanol manufacturers. I understand my opponent in this election is trying to link me to the former President of Green Global who being investigated over a ill advised e-mail he sent to the Town of Gilbert. The only connection between Green Global me is they are a client of mine, just as they are a client of the Rose Law Firm, and the Law Firm of Pew and Lake. If I am elected how will I work with the existing town councilmembers? I have a collegial relationship with all of the members of the council, but have a different opinion on some, but not all, of their council decisions. I don't believe the community is well served by seven members of council with only one opinion between them. One of the most important reasons to vote for me is to get some diversity of thought on major council decisions. Every member of council is professional and understand their first duty is to the community. I don't think anything will interfere with that.